World Percussionist and Grateful Dead co-drummer Mickey Hart returns to the Masonic Auditorium, Saturday, September 23rd, with his legendary Planet Drum group. This latest incarnation, as part of a SF Jazz Festival special event, Hart reunites his fellow percussion virtuosos; Indian tabla phenomenon Zakir Hussain, conga maestro Giovanni Hidalgo and African percussionist, Sikiru Adepoju. This latest incarnation of Planet Drum builds on the legacy of the group that won 1991’s first-ever “Best World Music Album” Grammy Award (for the self-titled record that held the #1 spot on Billboard’s World Music chart for 26 straight weeks). Hart is best known for his nearly three decades as an integral part of an extraordinary expedition into the soul and spirit of music, disguised as the rock and roll band the Grateful Dead. As half of the percussion tandem known as the Rhythm Devils, Hart and Bill Kreutzmann transcended the conventions of rock drumming. Their extended polyrhythmic excursions were highlights of Grateful Dead shows, introducing the band's audience to an ever-growing arsenal of percussion instruments from around the world. Exposure to these exotic sounds fueled Hart's desire to learn about the various cultures that produced them. His tireless study of the world's music led Hart to many great teachers and collaborators, including his partners in Planet Drum. Planet Drum's self-titled album not only hit #1 on the Billboard World Music Chart, remaining there for 26 weeks, it also received the Grammy for Best World Music Album in 1991-- the first Grammy ever awarded in this category. 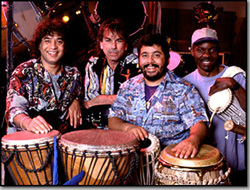 Planet Drum is one of twenty-nine recordings released on Hart's the WORLD series on Rykodisc Records. The WORLD offers a wide variety of music from virtually every corner of the globe with releases like Voices of the Rainforest from Papua, New Guinea and Living Art, Sounding Spirit: The Bali Sessions. Hart's experiences have paved the way for unique opportunities beyond the music industry. He composed a major drum production performed by an assembly of 100 percussionists forthe opening ceremony of the 1996 Centennial Olympic Games along with Zakir Hussain, Giovanni Hidalgo and Philip Glass. Additionally, Hart has composed scores, soundtracks and themes for movies, television, and home video including Gang Related, Hearts of Darkness, Apocalypse Now, The Twilight Zone, Vietnam: A Television History and The Next Step. Hart's lifelong fascination with the history and mythology of music is documented in three books: Drumming at the Edge of Magic (written with Jay Stevens and Fredric Lieberman), Planet Drum (with Fredric Lieberman and D.A. Sonneborn) and his 1999 offering, Spirit into Sound: The Magic of Music (written with Fredric Lieberman). The three books are published by Grateful Dead Books. In August of 2000, an extensive exhibit of Hart's percussion collection, A Journey Into the Spirit of Percussion, opened at the San Francisco Airport Museum in the United Airlines Terminal. Several years ago, Hart was appointed to the Board of Trustees of the American Folklife Center atthe Library of Congress where he heads up the sub-committee on the digitization and preservation of the Center's vast collections. This has evolved into "Save Our Sounds," and the Saybrook Graduate School and Research Center conferred an honorary doctorate of humane letters upon Hart for his work in advancing the preservation of aural archives. I had the pleasure of working with Hart and one of his previous versions of Planet Drum, featuring drummer Ron Molo, following their show at Woodstock in 2000. His hearing wasn't what it once was, (the result of too many Dead shows), however his energy, and the music of Planet Drum remains as viable and vibrant as ever.